"Special Songs for Special Times" Reviewed by RadioIndy.com! 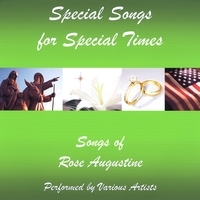 "Special Songs for Special Times" is the most recent release from Rose Augustine. It is an album in which Rose is accompanied by various talented vocalists, and features songs that mainly focus on the interplay of vocals and gentle piano playing. It, like the titles implies is an album that is meant to be both a celebration of the Christian faith and of the special moments that occur within one's life. In "With This Ring, I Thee Wed" we hear Rose's soaring voice alongside soothing piano playing, in a song that celebrates the act of marriage. For "Alleuia, He Is Risen" one encounters Rose singing along side other vocalists in a more upbeat and inspiring tune that is in reverence of the sacrifice of Jesus. "Memories of Auld Lang Syne" is a slower piece in which Rose thinks out loud about spending New Year's Eve with her loved one. This album is perfect for anyone who enjoys talented, yet soothing music that springs from a Christian faith and a love of the important moments in our lives. RadioIndy is pleased to announced that we have published our CD Review of Rose Augustine music to CD Baby. FANS - Please checkout Rose Augustine online! FANS - Please checkout Rose Augustine page and sample / purchase some great new music! FANS - Please checkout Rose Augustine iTunes page play / purchase some great new music! Radioindy has published Rose Augustine CD Review to lala Music Online. FANS - Please checkout Rose Augustine la la and play / purchase some great new music! RadioIndy created a CD Announcement Press Release for Rose Augustine on Digg.com!